Winter might not seem too cold and dreary at first, but when snow shoveling and ice scrapping starts to get the better of us, head to Pleasure Island, North Carolina to defeat those winter doldrums. Carolina Beach and Kure Beach offers a variety of events, activities and local attractions to our guests, but did you know that the fun continues even in the off-season? As the daylight hours get shorter, many visitors may not know of the interesting things they can experience when spending a lovely and quiet vacation on Pleasure Island during the winter months. And remember to let A1 Property Management add some additional warmth to your vacation accommodations along Kure Beach and Carolina Beach with our exceptional customer service and amenities. The North end of Carolina Beach offers locals and visitors alike the chance to drive along shore in our Recreation Area known as Freeman Park. What is special about Freeman Park Recreation Area is the two miles of completely undeveloped coast that spans the Northern tip of Pleasure Island along the Atlantic Ocean to the Carolina Beach Inlet. 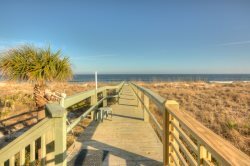 It is truly a rarity for such a large span of beach to lack development and offers the perfect quiet getaway for your winter vacation here on Carolina Beach. Enjoy fishing, shell collecting and camping by a fire during the rare span of time when Freeman Park is delightfully deserted. While Freeman Park is a great place for camping and boating, the Southern tip of Pleasure Island offers the second drive on beach out of the scarcely found locations as such in North Carolina. Drive onto the sand from the Fort Fisher Recreation Area and experience the beach like never before. Unlike Freeman Park, Fort Fisher is located between the Atlantic Ocean on the East and the Cape Fear River Basin on the left. This makes for a spectacular evening of driving along pristine sands and is ideal for finding completely intact seashells, sea glass, sharks teeth and sometimes even historic artifacts like medicine bottles and even arrow heads. Come experience the beach at its finest hour this winter season and enjoy this unique opportunity! During your winter stay here on Carolina Beach not only does the Aquarium at Fort Fisher provide a nice activity for the whole family to enjoy with its various species and displays for you to watch, learn about and enjoy, but you can also enjoy it's hands on surf fishing program! Learn how to use surf fishing equipment, how to identify local fish, and all about what baits are commonly used. This program includes all bait and equipment along with the guide of an experienced instructor. This 3 hour special activity is only $15. If surf fishing isn't for you, then consider participating in the Aquarium's "Behind The Scenes Tour" and learn about the daily workings that keep this Aquarium thriving. You will get to explore animal husbandry spaces, holdings, and life support systems up close and personal! This is an exclusive opportunity for any animal lover and future Aquarists! A1 Property Management has many wonderful Kure Beach vacation rentals to offer. Guests staying in one of our rental homes or condos enjoy a special amenity. In the off-season, guests here have full use of the Ocean Dunes Recreation Center. Come enjoy an afternoon of swimming in the indoor pool, heated to a warm 88 degrees, or relaxing in the hot tub. Along with the recreation center swimming pool, guests may enjoy detoxifying and steaming in the sauna or use the Fitness Center complete with treadmill, elliptical, Stairmaster, free weights and more. Because North Carolina often experiences warm days in our off-season time, the tennis courts, basketball court, shuffleboard court and play ground are often utilized by our guests during this time. Whether its a relaxing day in the water, or a day filled with fitness and fun, our recreation center at Kure Beach has it all.